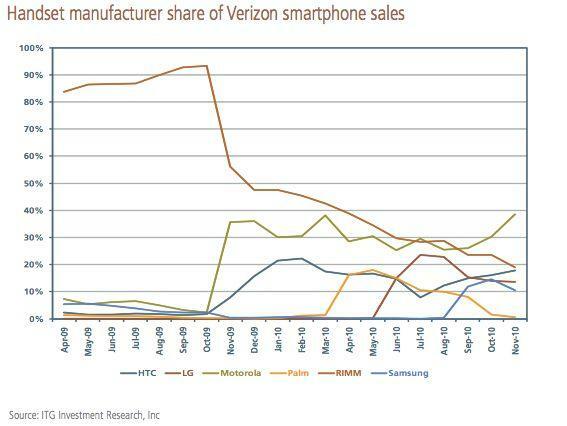 According to a report by John Paczkowski of the Wall Street Journal's "Digital Daily" blog, RIM's slip at Verizon was documented by ITG Investment Research analyst Matthew Goodman, who charted RIM's decline at Verizon at the hands of new Android models (chart below). The startling speed at which RIM plummeted from being Verizon's number one selling smartphone platform to being a minor player neck-and-neck with Verizon's top four Android licensees closely mirrors the timing of the "Droid" ad campaign Verizon began at the release of Motorola's first major Android smartphone last winter. Prior to the launch of Verizon's Motorola Droid, Android had a negligible share of Verizon's smartphone mix throughout 2009, with all Android licensees together amounting for less than a ten percent share of the provider's smartphone sales. Most of those licensees were also making a number of Windows Mobile phones for Verizon last year. Verizon's big push to sell Android devices in 2010 was motivated by a desire to sell more lucrative data contracts, something that RIM's existing BlackBerry models (and the Windows Mobile phones of Verizon's current Android licensees) had failed to do in 2009. The problematic launch of RIM's iPhone-like BlackBerry Storm in November 2008 did little to slow the rapid decline of BlackBerry at Verizon, and likely emboldened the carrier to shift its efforts to Android, which did manage to sell well as an alternative to the AT&T-exclusive iPhone. The Storm's failure at Verizon wasn't evident in the company's press releases, which claimed at the time, "customers across the country lined up to purchase the new BlackBerry Storm. The Storm offers customers the reliability of the Verizon Wireless 3G network and the full power of a revolutionary touch-screen, multimedia smartphone with global connectivity." Despite Verizon's enthusiasm, the Storm launch was plagued with bugs and failed to generate more than a fifth of the sales of the iPhone 3G at Verizon's US rival, AT&T. A second Storm2 model released late last year was given only minor attention by Verizon as it flexed its 2010 marketing muscle behind the new crop of Android 2.0 phones, led by Motorola's Droid. Commenting on the last year of sales, Paczkowski wrote, "with sales of the [BlackBerry] Tour/Bold series dwindling and no Storm refresh in sight, BlackBerry sales at Verizon are in serious decline." Verizon reportedly believes that RIM's latest BlackBerry OS 6 will not have a "material impact" on its business. While RIM's smartphone sales at Verizon have crashed, the Canadian phone maker is still the second largest of Verizon's herd of smartphone vendors. That's because, while Android now collectively makes the majority of the provider's smartphone sales, the installed base of Android smartphones is split between a variety of competing hardware manufacturers. Motorola's Android smartphones only decisively surpassed RIM at Verizon late this summer; Motorola had been selling more phones overall (outside of smartphones) than RIM throughout the entire year. Behind Verizon's first place Android vendor Motorola, its second is HTC, which was just below RIM at Verizon in November, and threatening to surpass it for the number two smartphone spot at the provider overall. LG, Verizon's third place Android vendor, sells the most Verizon phones overall outside of smartphones (nearly a third of all Verizon phones). It just began selling Android smartphones at Verizon this summer. Similarly, Verizon's fourth place Android vendor Samsung also sells a large share of the company's non-smartphone models (more than a quarter). It too just recently began selling Android smartphones in the third quarter. Just last month, Samsung also began selling its iPad-alternative, the Galaxy Tab.